Is comparison the thief of joy? Maybe, but only if you let it be. I think comparison is a healthy tool we can use to improve ourselves. We constantly see posts about not comparing ourselves to other people and how damaging that can be, but I think it's all in how you look at it. Instead of feeling down on ourselves, why not be inspired and strive to improve? 1- My house is cleaner- seriously! There's nothing like seeing spotless houses all over Instagram to make you want to clean and organize your own. I know a lot of them are just the "Instagram Illusion" of clean, where they have a clean corner and the rest of the house behind the camera is a mess, but I've seriously upped my cleaning game lately and I'm not mad about it. 2- We're becoming healthier. I grew up on hot dogs and Kraft Dinner- and there's nothing horribly wrong with that, but I can't help but compare myself to healthier families and realize we can do better. I'm not talking kale at every meal, but seeing other moms feed their kids healthy foods makes me realize how doable it is. We're also more conscious about what we put on our skin (I'm obsessed with finding the perfect all natural sunscreen)- so thank you all natural healthy mamas for inspiring me. 3- I'm taking better care of myself. We've all talked about the mom's at preschool drop off who have their hair and makeup done while we sport sweats and a mom bun- but why do we hate them so much? They're no better than us- they probably just wake up earlier. It's doable. I'm 27 years old, in the throws of young motherhood, but I can and will make the effort to get myself ready in the morning. Starting tomorrow. 4- We're spending more time outside. I've always admired the adventurous outdoorsy mom's who take their babies hiking on their backs, and always seem to be outside. We go on walks often, but I'm kicking it up a notch this summer. There will be no iPads allowed in the house this season- we're going to be outside as much as possible. Sorry Netflix. 5- I'm keeping my son safer. I've seen people roll their eyes at the safety police moms,always posting about extended rear facing and proper chest clip placement. When I was pregnant with my son I knew nothing about car seat safety. I kept seeing mom's post about proper safety techniques and I instantly wanted to know more. Instead of scoffing at them, I became one of them. My 3 year old is still happily rear facing thanks to those moms. 6- Vaccinations. Just kidding, I'm not going there. This is SO true. I compare myself to other moms in all these same ways, but I'd never really thought about the fact that it's actually making me better. There are definitely ways to ruin yourself through comparison, but these are good ones to focus on! I read your title and was like "oh no" where she going, but you have some excellent points. 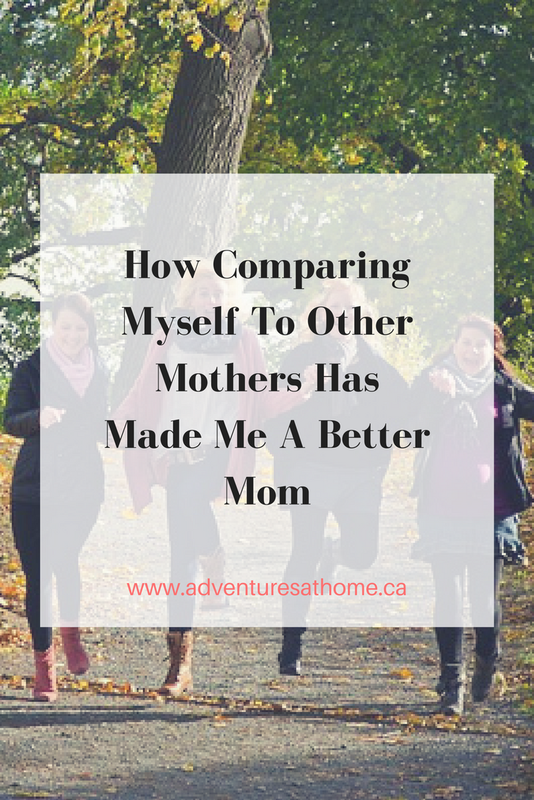 There are some great areas in my life where comparisons has made me a better mama. The trick is to not let those comparisons overwhelm you, exhaust you and bring you down. As long as they make you a better version of yourself, lets go for it. My house is definitely cleaner in my obsession of comparing myself, but my cooking is definitely sub par. I can so relate to this. I've been comparing myself to other moms too and it really does motivate you to try harder and change for the better. This is so true! I really thinks it's all in how you look at it. I used to scream "don't compare me/myself to other moms" but since I have met a few friends that are AMAZING moms, I strived to be more like them and it has made me better for my family. People look up to models, celebrities and successful people in business so why not do the same for a MOM OR DAD that's winning at parenting?! Loved this post! Thank you for sharing! Great points. Comparison does not have to be a negative. It can be very positive when we think of it in terms of learning from others. More often than not, women are always the ones who compare themselves to others. We are such emotional beings, and the smallest things about others we view so highly. We do this because well we're human. I know that I certainly compare myself to women who look so good coming out of the house, in comparison to me. But I love how you've taken these comparisons and made them into something positive! I love how you've taken it as a learning experience. Kudos to you! You're an amazing person! I nominate you for the Blogger Recognition Award (https://imommy.co/2017/04/28/blogger-recognition-award/) for setting such examples! Lol! It's so hard not to compare yourself. But it stands to drive you insane, good for you finding the good in it!